Hello! This is my first post in this blog. A month ago I bought three cameras W90P745 model (from Chinavasion.) Everything worked perfectly until one day a camera stopped working. The camera turned on, but the green light on the front is not lit, either with the cable or wifi. I decided to buy the cable and try to come back to life using your method. But both the rise of file romfs.img linux.zip as 30% I get a message “General failure” (I select the file and put Xmodem protocol. Magurin, it is rare that one day stop working. I just send you an email with linux.zip and romfs.img of Foscam, this files work well with my camera. One of my visitors reported that his Chinavasion camera burned 15 minutes after having been powered on (http://www.gadgetvictims.com/2008/08/foscam-fi8908w-firmware-history-page.html). It looks like they provide unsuitable power adaptors. Check for burned components inside the camera (unless you want to return it under guarantee), or even a distinctive smell. I have the same propleme like magurin!! Oskys Can you please send me too the files from Foscam that you have send to magurin? and on the file : https://docs.google.com/uc?id=0B9kFXSWngqLWM2NiNmU2MDctNmNiZi00YzY4LTkzMDktYTVmOTA3Y2Y4Yjcx&export=download&hl=en — I found other guide . Is there any way to get the firmware from the camera as a backup before trying to update?? With this connections, my cam works fine. 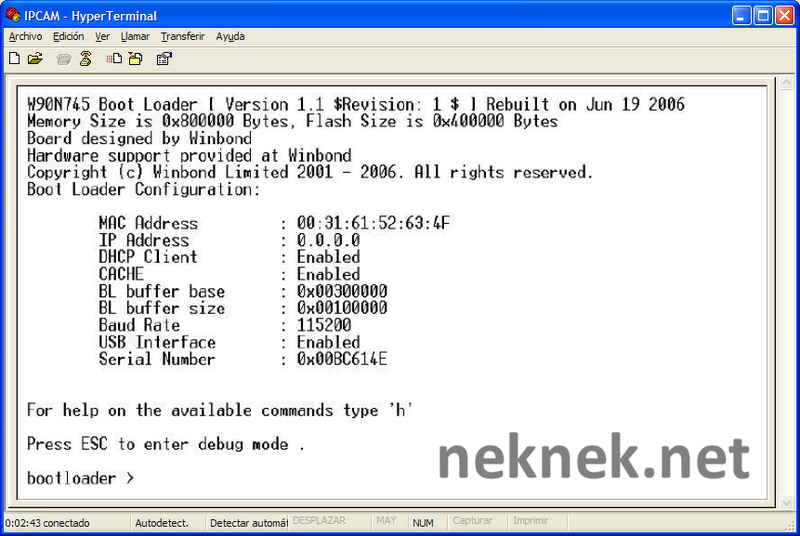 Toadstul, you can donwload the files in http://www.neknek.net/wp-content/uploads/2010/08/foscam_linux_romfs_files.zip and tell us. John, I don’t know how save the firmware before to update but I think is possible, I’ll investigate how. the connector on the ipcam is it reverse ! cables ,white ,brown ,black and yellow ,must be reverse respect your photo of the ipcam pcb. I bought a IP Cam from ChinaVasion (Foscam clone) The PCB says: ES_IP607_ARM_2 Without thinking I tried to flash a FOSCAM firmware on it. It is now bricked, I have a RS232 thingy, so I can het into the bootloader and tried different linux.zip and romfs.img files, starting with the obvious one yje “Foscam Clone IP607″ recovery. When I try this one the cam accepts the files, but it keeps rebooting after that. I have two more good working cams, and I’m looking for a way to dump the firmware of the working cam so I can flash it to the bricked one. 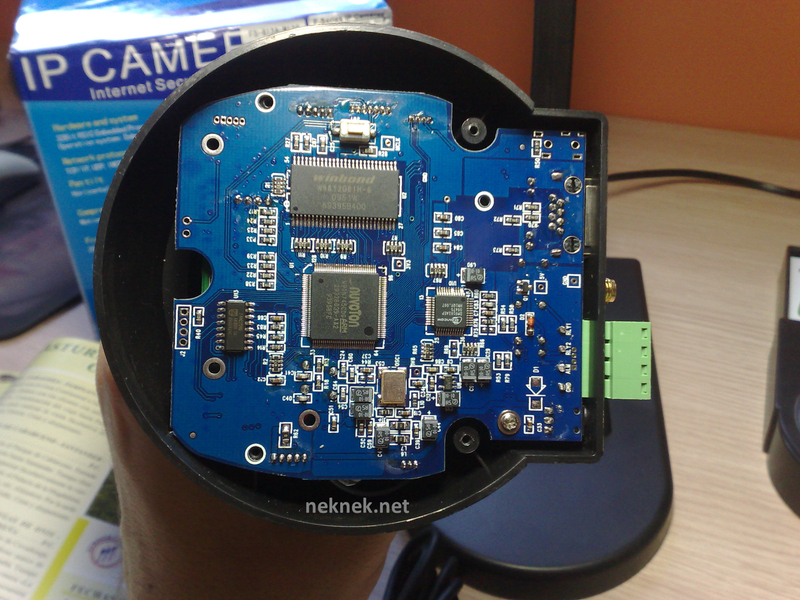 Does anyone have an idea how to dump the firmware of the camera? I tried to flash my EasyN cam with Foscam firmware (didnt realise it was a clone). It bricked the camera, constant restart. Using this guide i was able to bring my camera back from the dead. & it now has updated firmware too. @Dave, you are right, I’ve just changed the photo, I didn’t take another photo, only a litte photoshop. Try and tell us your experience. I tried loading the same firmware + web ui mentioned in this webpage but I ended up with a cam that restarts every 3 seconds. And I have managed to check the web ui + firmware cmos versions and they are the same as the ones mentioned. Is there any other way of doing this without the USB / UART interface ? And in case not please tell me from where I can buy the interface. @Slauck, you need the USB/UART interface, you can buy this in ebay, usually it costs between USD 10 ~ 20, in my case 9 EUR (USD 12). I had the same problem, the cam restarted every 3 seconds, but with this guide, and software, I solved the problem, the same that 2 or 3 visitors more. Tell us more information about your cam to solve the problem if you follow all the steps of this guide. Okay,I will try it after I get UART to USB piece. 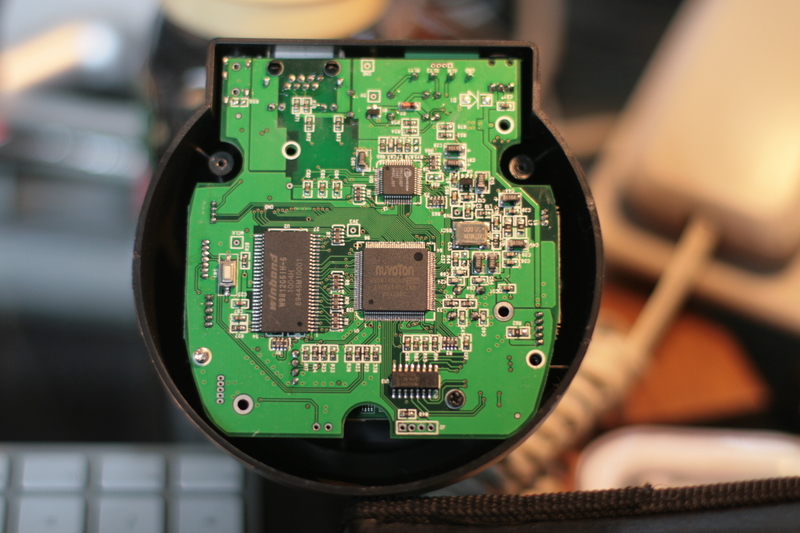 But is there any way I can extract the firmware from… because I need to work on the web ui of another similar cam. And I am really afraid to load the firmware available in this webpage.. since already the box looks the same one in this page. MY Cam went crazy maybe because of the wrong sequence. Will this item on ebay works fine ? “USB 2.0 to TTL UART 6PIN CP2102 Module Serial Converter” Please check and tell me. I have a Maygion camera, if pssoble, give the mem dump of this cam, else, give from foscam. Problem solved (at least, my problem). The Xmodem file transfer works fine now. I was using a laptop with Linux (and some times a WinXP VM), I think something is wrong with the laptop serial port timers (also used a USB-> serial interface) or maybe its Linux.Now I’m using a desktop with Win7. With the debug mode’s commands using HyperTerminal ? I bricked my IP camera (from DealExtreme – Foscam fake). 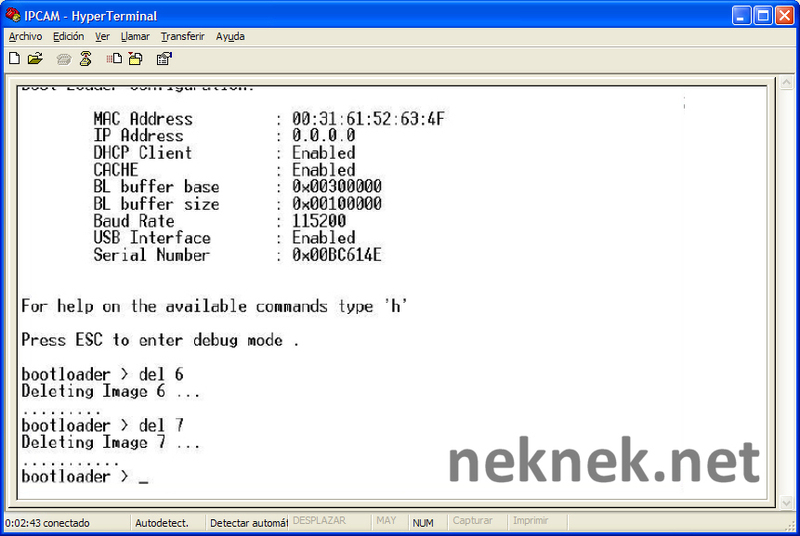 I can recover the camera ONLY with this files (http://www.neknek.net/wp-content/uploads/2010/08/foscam_linux_romfs_files.zip). So, i can upgrade the system FW version to 11.14.1.42 and 11.14.1.46, but i can’t recover the Web UI from any version. and i must do the unbrick again. 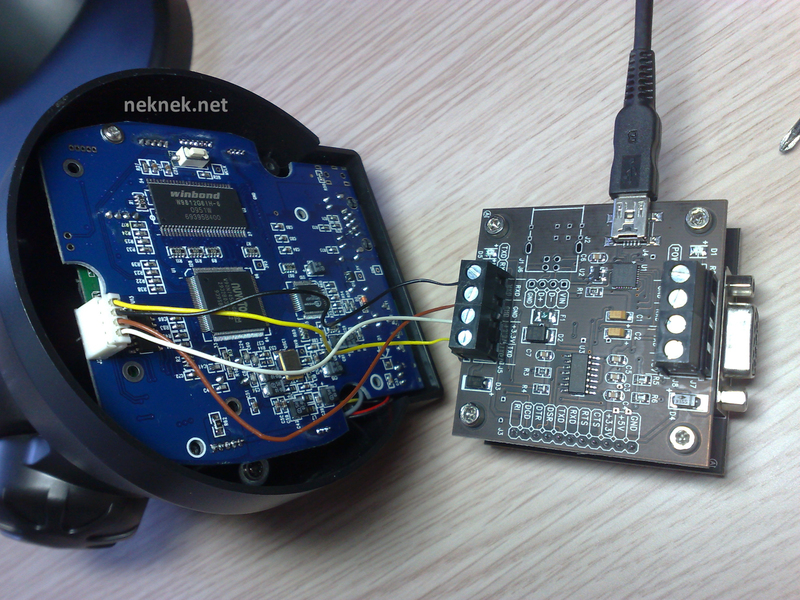 I connected my bricked Pearl Robocam directly to serial port, just crossed rxd and txd, connected gnd and started hyperterminal. I only get some weird characters, about three lines long. then nothing is possible… the camera doesn´t answer any more. Do I HAVE TO use the usb converter? Its not a usb converter. 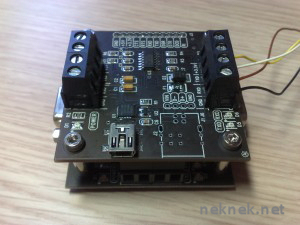 Its a TTL to RS232 level adaptor. Suggest once you buy another serialport or cam to replace the one you’ve just fried, then try again. The reason we need to use a TTL adaptor is that the CPU outputs at somewhere between 3-5v. RS232 runs at -12v and +12v. A TTL adaptor takes the incoming voltage and converts it to the correct level needed for rs232. Typically Feeding incorrect voltage into something generally kills equipment. 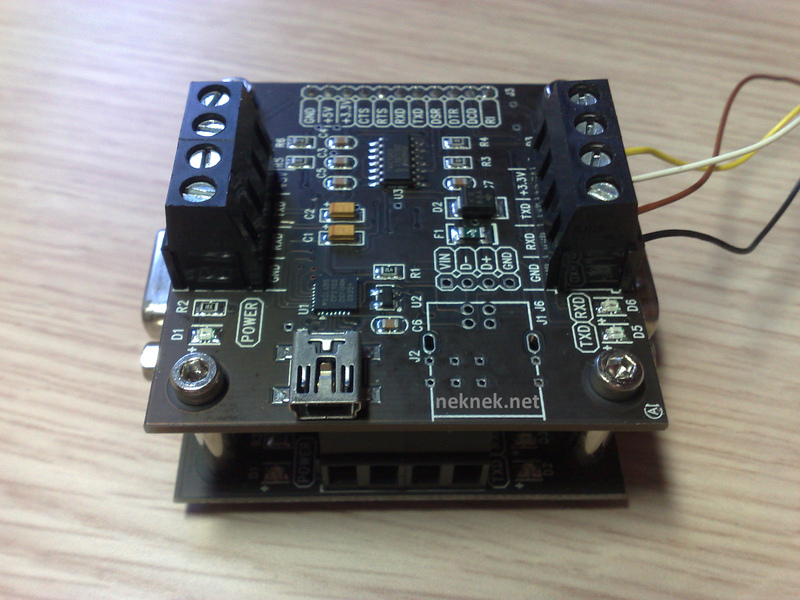 I usually use a max232 based serial version, but in the above NekNek page he’s likely using an FTDI usb version (which does 2 jobs – TTL to rs232, then putting that rs232 over usb). 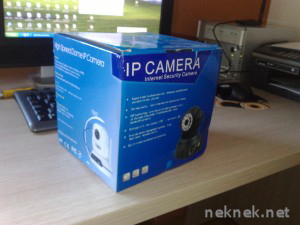 Hi, i have an 7Links Robocam (Pearlcam PX-3309-675). I think, its the same as Apexis J-011-WS (the Webinterface was the same). A error while i installed the WebUI-Update crashed my cam. With seriell-Uart now i have installed different versions of linux and romfs, but the cam works not correct. I cant install the WebUI. So i think, i need the original romfs and linux for this cam. I’ve bought a similar camera over ebay. The sticker on it says “FS-613A-M136 b2″. I am unable to make it work with wpa or wpa2 only with an open wireless network. Is there a firmware I could flash, to get wpa2 working? Has anyone else had similar issues? Is any of you running wpa or wpa2 successfully? Thanks for all your answers in advance! Thanks for the Page, I have the same camera and I damage trying to change to unsupported firmware. With this procedure I can recover my camera. Im looking for a new firmware to solve the WiFi issues. Any link to new working firmware will be appreciated. I was having wireless connectivity issues until I set the time correctly. I first had to ‘sync with PC’ and then just use the default NTP settings. For the ones who may be facing the problem “general failure” with hyperterminal when uploading files to the camera. I solved it using the hyperterminal which came in Win XP using Win XP, do not use hyperterminal (private edition) available in internet.